The Book: Keeper of the Clown - Hey Vern! It's Ernest. John R. Cherry to Release a memoir in Spring of 2013. 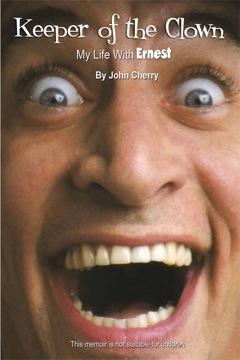 In his memoir of the “Ernest years,” director John Cherry reveals how he and the creative staff developed the character of Ernest, put actor Jim Varney in a khaki baseball cap, sold TV commercials to scores of clients, nabbed Barbra Streisand’s manager as his own, and successfully directed Varney’s unpredictable creative genius. He recounts the thrill ride of taking the character Ernest from local TV ads to big-screen movie hits – all the while tackling challenges from bankers, the IRS and Disney executives. Readers get peeks into Varney’s personality such as this description of Jim cutting his wedding cake without the bride: The sword came down like a guillotine. It was a clean, even slice. The wedding cake stood tall and proud. A thin mark down the side was the only evidence that hinted at its severe wound…“Let’s go shoot my 44 magnum!” Jim called out. Using the same imaginative story-telling ability that produced Ernest ads and movie scripts, Cherry discloses the business side of the Ernest empire: negotiations with Disney execs, traveling to Canada and South Africa for locations, flirting with bankruptcy, landing clients across the country, and buying a 727 airplane. Print editions of Keeper of the Clown are laden with photos, production stills, and even a few movie storyboards sketched by Cherry in preproduction. While the paperback edition will also available in bookstores, this site will be the only place to order the hardback version. The eBook (with fewer photos) will also be available by clicking through this website to Amazon.